Flash forward to 2013, after hundreds of highlines had been rigged all over the world and my experience pioneering rope swings developed further, I was approached by Scott Rogers to facilitate the first commercial film project of our enormous canyon rope swing. The video montage I published from the first rope swing experience surprisingly caught the attention of over 400,000 YouTube viewers in a short time and was featured on several international television shows and shown on CNN news. This sudden viral exposure explosion opened the door for future momentum as more film makers were eager to repeat the adventure. Devin Supertramp, who currently boasts almost 4 million online YouTube followers was excited about the project and contacted us as result. Realizing that we had the most rigging experience and knowledge amongst his group of 30 excited youths from Salt Lake City, we became directly responsible for the entire rigging set up and crew safety operations. Over a very cold 3 day period in harsh winter conditions, we facilitated over 20 inexperienced jumpers to step into the void and taught them the climbing skills needed to safely ascend out of the canyon on fixed ropes. Due to our professional handling and thorough rigging, everyone who was part of the project left with a HUGE smile on their face, a greater sense of their personal empowerment and a profound appreciation for our rigging skills. Scott and I helped film and document the experience as well, rappelling from ropes inside the canyon to capture unique angles where other film operators were unable to work safely. 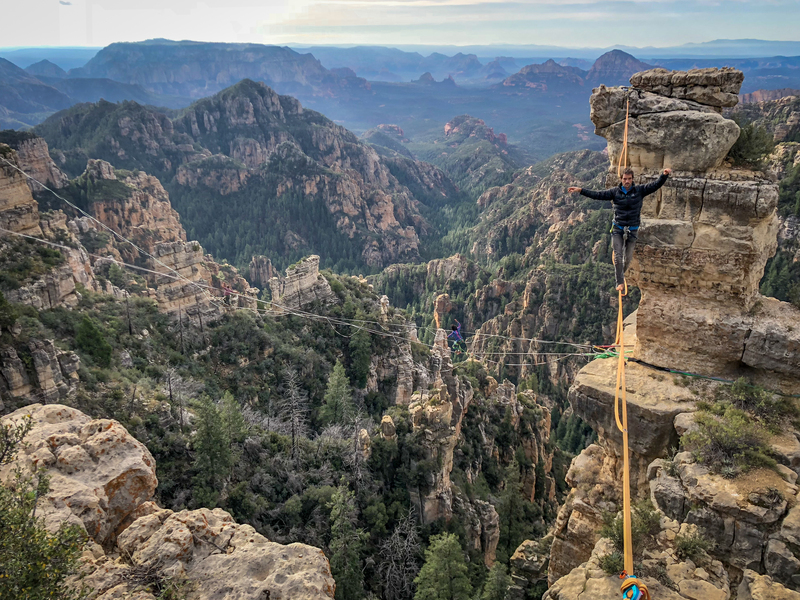 This type of project is where we most naturally shine as professional athletes and videographers, capable of capturing the epic shots that require advanced rope skills while maintaining an enthusiastic attitude the whole time. Little did we know then, but this viral video launched a career of commercial rigging opportunities and adventures all around the world for both us. We continue, to this day, documenting big adventures and following our dreams of building complex rope systems for commercial work and inspiring others to find the courage within themselves to overcome any life challenge. Check out the Behind the Scenes edit below!